Regulation is one of the key levers of government intervention. When properly designed, it can help achieve environmental and social objectives, and contribute to economic growth. 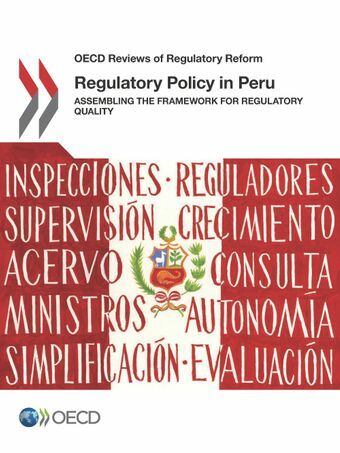 The OECD Review of Regulatory Policy of Peru assesses the policies, institutions, and tools employed by the Peruvian government to design, implement and enforce high-quality regulations. These include administrative simplification, evaluation of regulations, public consultation, and the governance of independent regulators, amongst others. The review provides policy recommendations based on best international practices and peer assessment to strengthen the government’s capacity to manage regulatory policy. Establish an oversight body which concentrates most, if not all, of the regulatory policy activities and tools currently spread across several ministries, agencies and offices. Issue a policy statement on regulatory policy with clear objectives, and include this statement in a law or other binding legal document. This statement should contain all the specific strategies and tools for effectively managing the entire regulatory governance cycle: from ex ante evaluation of draft regulation, including encouraging regulation based on evidence; public consultation and stakeholder engagement; administrative simplification and review of the stock of regulation, including ex post evaluation; inspections and enforcement; and forward planning. Measure the administrative burdens created by formalities and information obligations. Include the policy on inspections and enforcement of regulations as an integral part of regulatory policy. Develop general guidelines relating to objectives such as ethical behaviour and corruption prevention, organisation and planning of inspections, and transparency. When issuing the statement on regulatory policy, include formal measures for co ordinating with subnational governments to promote a coherent national regulatory framework, such as conferences to exchange practices, help desks, and guiding documents; and actively promote the adoption of regulatory tools such as analysis of draft regulation, public consultation and stakeholder engagement. For more information please contact Manuel Gerardo Flores and Andres Blancas.